I was walking around Orchard Road and saw the Lucky Plaza, the mall for Filipinos, as what they call it. Because Filipinos are here to meet during weekends. I go passed by ION mall then the MRT station, Red Line which connects the City to the North and back to South of Singapore. What struck to my mind is the amazement of the place. How in the world is Singapore prosper to a greater heights from the third world country to the first and one of the top cities in the world? 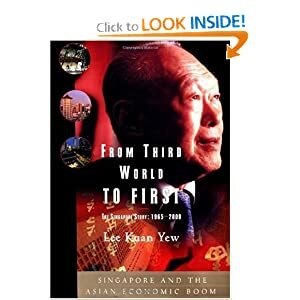 I searched in the internet and found the book written by the Father of Singapore, Minister Mentor Lee Kuan Yew. An amazing work by the genius, MM Lee.